This book is FINALLY out, my copy arrived in the post this morning and it features 2 pages of my Bon Accord Baths photos!! How excited am I !! "Dr Ian Gordon, himself a former competitive swimmer, is the medical doctor for the Amateur Swimming Association and has been researching the history of swimming pools for over 25 years." Amazon don't exactly 'sell' it well. Is this one in it? Raddog Yes!! A lot of them are built to the same design. Thanks for putting info up about this book. Im ordering mine today. Down here in Edinburgh, our Commonwealth Pool was about to closed but the council decided to refurbish the place .It would have beeb a great explore as its massive and I never really liked it....it was always cold and a bit dirty. I could go on and on about pools, so ill stop! I am a great admirer off your work by the way. I went to the commonwealth just a couple of years ago, and headed straight for the top diving board. I was stopped in my tracks by an attendant who told me a qualified diving instructor had to be at poolside for h&s reasons before anybody could use the boards! Id have liked it demolished as long as we were getting an olympic standard pool in it's place not some fun pool about 0.8m deep! 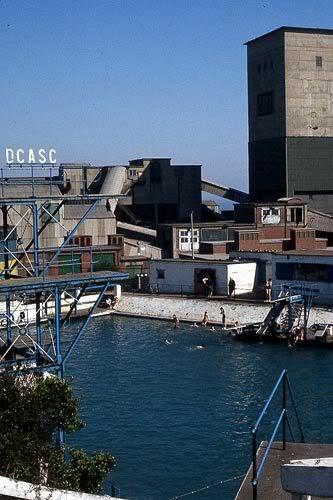 It would be nice to see a companion book of lidos and outdoor swimming pools. Most of the ones I have been to as a kid have gone now (some have been replaced by paddling pools). No doubt they were strangled out of existence by the health and safety brigade. Random quote that made me laugh: "Just my tuppenworth, but personally I wouldn't get out of bed for an asylum. They are so DONE. I'm just waiting for Disney to open up a McWhittingham somewhere, with animatronic security guards and a rollercoaster through some smashed up kitchens." Thanks, that looks really interesting. And I would suggest a visit to Budapest if you haven't been, for seriously beautiful retro spa/pool action of the non-derelict variety!